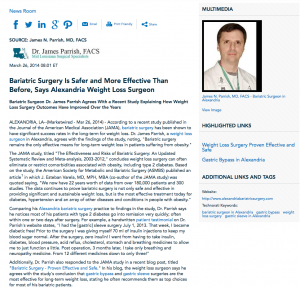 Bariatric surgeon Dr. James Parrish agrees with a recent study explaining how weight loss surgery outcomes have improved over the years. Additionally, Dr. Parrish also responded to the JAMA study in a recent blog post, titled “Bariatric Surgery – Proven Effective and Safe.” In his blog, the weight loss surgeon says he agrees with the study’s conclusion that gastric bypass and gastric sleeve surgeries are the most effective for long-term weight loss, stating he often recommends them as top choices for most of his bariatric patients. Although the study mentions there are still risks of complications associated with bariatric surgery, according to Dr. Parrish, the safety of these procedures is comparable to a typical laparoscopic gallbladder surgery. He reminds individuals who may be at risk from obesity-related comorbidities that weight loss surgery can help them improve their overall health. Dr. Parrish urges anyone suffering from obesity to contact an experienced bariatric surgeon and schedule a consultation to see how the surgery can help them. Dr. Parrish is a Fellow of the American College of Surgeons, and is currently President of the Louisiana Chapter of the American Society for Metabolic and Bariatric Surgery. He performs a variety of weight loss surgeries at Central Louisiana Surgical Hospital and Christus St. Francis Cabrini Hospital, and he is Medical Director of Bariatric Surgery at both hospitals. Dr. Parrish is available for interview upon request. 1 “Bariatric and Metabolic Surgery Even More Effective Than Previously Reported and Getting Safer” – connect: the official news magazine of ASMBS.